A Mustang murdering the curbs, not people; which is a nice. The Grand Prix Of St. Petersburg. Finally. 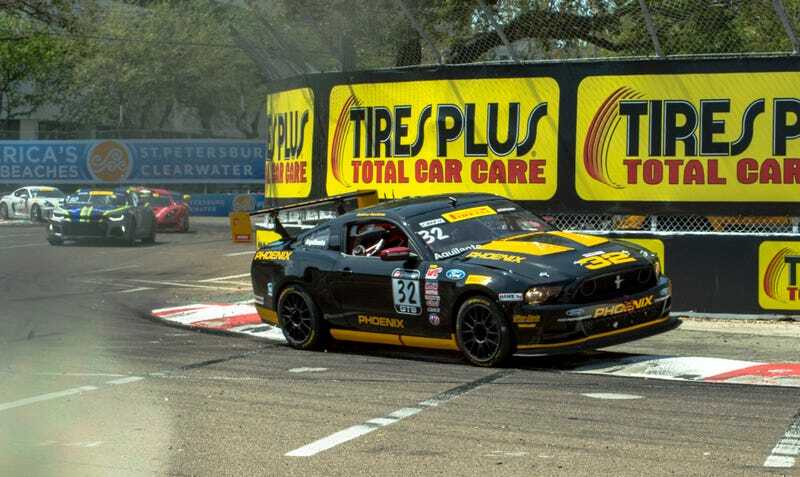 Today, was mostly practice and qualifying for all of the series that run here, with the Pirelli World Challenge GTS class having the only race of the day. I spent the first half of the day running around the support paddock, because that’s where the good stuff is. I also had the pleasure of meeting up with Azrek and his crew. Good folks. The second half of the day was spent in the shade at the top end of the track. I took too many pictures on Friday. Over 2000. I have a problem. Mind you, a lot of that was using burst mode, so most of those are crap. What follows is a handful of the good ones. I haven’t properly gone through all of the shots yet; just pulled these out. Going through the majority of the “cars on track” pics is going to take some time, so those will come sometime next week. Alec Udell taking full advantage of the enormous wing on his Porsche. The wing also works as a bed, shop work bench, and table to hold Last Supper recreations at. They let this kid sit in the KTM. They would not let me sit in it. The NSX looks much better in person that I thought it would. I find this oddly arousing. There was a monster hiding out in the dark of this garage. I’m still chasing this stop sign shot. This, I believe, is Alexander Rossi. Sebastien Bourdais showing complete contempt for the traffic laws of the city he calls home. And these are my two money shots of the day. They are of Alex Riberas’ No. 61 R. Ferri Motorsports Ferrari 488 GT3 as it sat in the garage before qualifying. It was early, and the sun was just starting to creep in to the garage. I really love these two pictures, particularly the one of the full side of the car. I hope you enjoy them, too. That’s all for now. Look for more each day.